The Shabby Stamper: It's a Brown Biter! Okay, I really love this little dog hanging off the skeleton dudes' leg! He reminds me of my Jack Russells, who will hang off a stick all day if they have to. I layered Black, Pumpkin Pie, Old Olive and two patterns from the Night and Day ds. 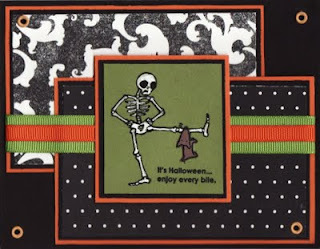 The skeleton dude was embossed with black detail ep and colored with a white gel pen. The dog is also heat embossed on Close to Cocoa and pieced on top of the leg. I got the idea for the skeleton from this months' Stampin' Success. Fun card! my daughter loves this image, she keeps pulling down the mini caty to show it to me.